Jennifer Mills Buchanan grew up on a cattle ranch in southern Oregon near Klamath Falls. Her love of animals is deeply rooted in her upbringing in a close-knit rural community. Active in 4-H and FFA throughout her childhood, her vocation was apparent to everyone but her until she decided to take a veterinary assistant job during high school. After that experience, she was hooked. She pursued a B.S. in Health Sciences at Oregon Institute of Technology before heading to Corvallis, Oregon to become a veterinarian. Dr. Buchanan graduated from Oregon State University's College of Veterinary Medicine in 2010 and jumped into shelter medicine with both feet! She began as a staff veterinarian at the Seattle Humane Society (SHS) of Bellevue/King County after graduation working with cats, dogs and pocket pets. While with SHS, Dr. Buchanan worked to improve the quality of care of pets both in the shelter and in foster (including fostering numerous pets herself). During her 5 years at SHS, Jennifer pursued additional training in high volume/high quality spay and neuter surgical techniques enabling her to alter as many cats as possible to help reduce the homeless pet population. Her interest and dedication to community cat care and TNR emerged from her close interactions with local caregivers and owners needing resources for the cats in their care. Since coming to FCSNP as the lead veterinarian in October 2015, Dr. Buchanan has embraced the philosophy of high quality TNR and hopes to continue learning and teaching through our mentorship program. Outside of the hospital, Dr. Buchanan enjoys raising her two small children on her hobby farm and hopes to learn how to brew her own beer in 2016. Her hobbies include hiking, bicycling, reading, writing and martial arts. She is also working on her Masters degree program in Shelter Medicine through the University of Florida. Sagan is a recent transplant to the Seattle area from Austin, Texas, where she was raised to have compassion for all creatures and grew up with numerous small animals. She received her BA in liberal arts in 2010, though it was no surprise to her loved ones when she started working as a veterinary technician with Emancipet in 2012. Her passion for helping both animals and their people through non-profit animal welfare was instantly sparked. Sagan then joined the tiny but mighty surgical team at Animal Trustees of Austin before moving to the Austin Humane Society for almost four years where she was a clinic technician and veterinary services supervisor. Ready for geographical change, Sagan moved to the PNW and had a brief stint in Seattle Humane's lifesaver program before the clinic manager position opened up at FCSNP (her dream job). There's never been a question for Sagan of the superiority of cats, and she brings with her a particular fondness for underserved cats and their caretakers. Sagan lives with her partner Liz and their three cats (Fifi, La Reyna Torcida and Sleater Kitty) and one anxious Aussie mix named Chloe who has a pacemaker. Her time outside of work is spent hiking, cooking and eating delicious vegan food, and fostering neonatal and sick kittens. 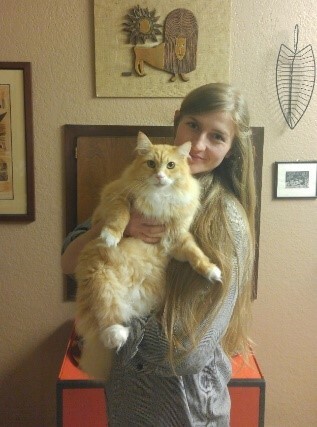 Jenna Harburg grew up in Seattle and later Edmonds, where she was partially raised by cats. Her first word was “kitty,” so she’s confident she’s in the right field. She grew up around animals of all kinds, (at one point tending a menagerie of frogs, fish, guinea pigs, 4 cats, a dog…) and spent years in 4-H showing draft horses. She attended university in Hawaii and Norway, and has her undergraduate degree in history and archaeology. Jenna comes to FCSNP with a background in arts nonprofits, where she has worked in everything from web design to art handling. She joined the team in 2018, and loves sharing her experience with an organization whose work she truly believes in. Outside of the office, she enjoys hiking, knitting, and historical reenactment. She lives in Mill Creek with her husband and their rescue cat, Persephone. For many years, Rita LaFuze has rescued homeless cats, many with kittens that eventually were homed. Rita began her career in the veterinary medical world in the 1990’s at a private feline practice in Edmonds. Her keen perception of cat behavior and her deep compassion for all living things led her to become highly trained as a veterinary assistant. Rita not only has experience with robust pet cats, but also worked many hours caring for intensively ill cats from all types of disease: cancer, renal failure, poisoning, infections. Her knowledge base is broad, yet her compassion never wanes. Each cat’s life is valuable and deserves the best care in her hands. FCSNP was lucky to add Rita to our team in 2006. Eudora has had an affinity for animals since she was a child growing up in Spokane. In 2007, she moved to New York to volunteer at Farm Sanctuary, a non-profit organization providing shelter to neglected and abused farm animals. After two months of volunteering, she was hired on full time as an Animal Caregiver. In this position she became familiar with working alongside both large animals (sheep, goats, cattle, and pigs) and small animals (rabbits, chickens, turkeys, ducks, geese). In 2010, Eudora returned to Washington, and started calling Seattle home. For several years she was the lead assistant in a feline-only veterinary practice on Capitol Hill. Eventually, she wanted to return to non-profit work, and after volunteering with FCSNP for four years, was hired as an employee at the end of 2016. When not working, Eudora and her partner, Shane, can be found hunting for treasures at a thrift stores around the PNW, or at home with their two cats Rizzo and Hammy. Tara joined the Feral Cat Spay/Neuter Project in 2018. Originally from California, she has also lived in Portland, OR before settling in the Seattle area. Tara has her Bachelor's degree in Biology and has worked in veterinary medicine since 2008. She has worked at several private practices as well as non-profit animal shelters, including Tony LaRussa's ARF in Walnut Creek, CA, and The East Bay SPCA in Oakland, CA. Tara has also worked at Veterinary Street Outreach Services in San Francisco, CA providing veterinary services to the homeless population and their companion animals. Tara truly enjoys working in animal welfare, and helping communities in need. Outside of work Tara enjoys traveling, time outdoors, reading, and watching movies at home with her cat Trout, goofy rescue dog Tater, and fiancé Cameron. Dr. Sandy Willis completed her veterinary degree at the University of California, Davis. She received additional training in small animal internal medicine at the University of Minnesota as an intern and at the University of Saskatchewan as a resident. She consults with veterinarians across the Pacific Northwest on all aspects of medicine in dogs and cats as a board certified small animal internist with Phoenix Central Lab in Mukilteo. Phoenix Central Lab is one of the few privately owned veterinary labs in the United States. Dr. Willis also gives seminars and wetlabs on diagnostic testing to veterinary staff and speaks at major veterinary meetings on how to communicate diagnostic testing and complicated medical problems to pet owners. She is passionate about supporting the bond that people have with their pets through a partnership with the family veterinarian and specialist when needed. Dr. Willis is past president of the Washington State Veterinary Medical Association, current chair of their annual conference and serves as the Washington State representative to the American Veterinary Medical Association (AVMA). She recently joined the board of the Puget Sound Veterinary Medical Association to help sustain an association that works to bring veterinarians together for education and camaraderie and to provide a resource to the public. Dr. Willis joined the Feral Cat Spay/Neuter Project as Board President in 2009 at the invitation of founder Dr. Christine Wilford. The two have remained friends and colleagues over the years. Dr. Willis has been honored and delighted to serve an organization that focuses on the cats and the people who care for them. She is proud of the work both board and staff members—old and new—have accomplished and all of the dedicated work volunteers have contributed to grow the organization. For Dr. Willis, leadership means empowering other people to rise to their potential and getting out of their way to let them shine. Dr. Willis has been owned by cats all of her life. Currently, she serves as staff for Lilly the Himalayan, Giselle the Oriental Longhair and Micki and Fii, recently adopted young kitties by way of MEOW Cat Rescue. They were both free roaming and altered by the FCNSP. Dr. Willis’ hobbies include swimming and cycling, the arts, wine appreciation and reading, the latter two hobbies preferably enjoyed with one of her aforementioned cats. Vicki has worked in management for Swedish Edmonds Hospital for the past 5 years. She started her career as an Animal Health Technician where she worked in several emergency veterinary hospitals as well as a small animal clinic. She then went to work at Cats Exclusive Veterinary Hospital where she truly learned the ins and outs of feline healthcare and became forever dedicated to cats. In 1998, Vicki joined the Feral Cat Spay/Neuter Project as a volunteer and has since contributed her time and skills in different aspects of the clinic. She has worked in the different stations of the clinic, including anesthesia, surgical prep, check-in and recovery. Vicki became a board member in 2010 to offer her voice on behalf of the trappers in the area. In 2001, she turned to TNVR as her primary focus after seeing a small ball of fluff sitting curbside within 3 feet from traffic! She asked for a mentor to help her learn the ropes and has brought many cats into the clinic since. Vicki believes in the ‘one cat at a time’ mission and is committed to improving the lives of free roaming cats. Vicki currently lives amongst her feral born cats, two of which were her first foster kittens, now 17. She learned quickly that keeping them ALL was not going to work and determined that she would only add those cats in need of Veterinary care. Each has a personality unlike the rest and that’s what she finds so fascinating in this world of felines. Vicki was instrumental in helping to form the group Community Cat Coalition of WA, a grassroots effort that has pulled together many aspects of trapping and rescue to enrich the lives of cats in the state, by members helping one another to create many more opportunities for trappers and foster parents for cats. In the past year, Vicki has co-managed a growing Facebook group that teaches TNVR, rescue and advocacy of community cats worldwide. She finds it very interesting to see how many resources there are in WA State as compared to many other areas around the country. Vicki enjoys helping to lend solutions to the problems many people face in their dedication to helping cats everywhere. Julia Jakubowski is the lead teller at the Holman Road branch in Seattle, WA. She holds a BS in Biological Sciences from the University of California at Davis. She has worked in the financial industry since 2012. Born in New Milford, Connecticut, Julia moved to Los Alamos, NM when she was 12. Julia’s love of the natural world started early. She grew up swimming in the ocean, camping, and visiting national parks across the country. She enjoys hiking in the Pacific NW and loves sharing her passion about the marine environment through her volunteer work at the Seattle Aquarium. Volunteering in her community is important to Julia and she is always willing to lend a helping hand to organizations in need. Katherine has been a senior HR director for over 30 years with experience in several industries including healthcare and insurance. Her background includes significant experience in employee relations, worker’s compensation, strategic planning, recruitment and selection as well as wage and hour matters. She holds a Bachelor of Science in Home Economics from Oregon State University. She and her husband Tom have two feral rescues named Figaro and Steely Dan as well as a Bernese Mountain dog named Smokey Bear. They have been supporters of the Feral Cat Spay and Neuter Project for over 5 years being enticed in to assisting with socializing kittens by her then colleague Vicki Faretta. Dr. Gross grew up in eastern Washington and received her veterinary degree from Washington State University in 2003. She began her career in small animal general practice in Las Vegas and later moved to the Seattle area to join a feline-only practice. She began volunteering at a local feline shelter, which led to an interest in feline behavior. Subsequently, Dr. Gross owned and operated a feline behavior house call practice for nine years. Dr. Gross currently works in the pharmaceutical industry as a field veterinarian, visiting veterinary colleges and hospitals. She also held a previous industry role with a pet insurance company. As a field veterinarian, Dr. 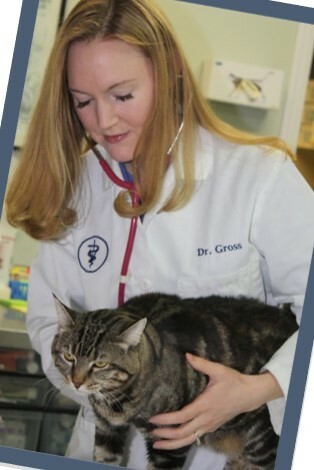 Gross enjoys working with students and promoting best practices in veterinary medicine. She is a past president of the American Association of Industry Veterinarians, has served on the AVMA Veterinary Economic Strategy Committee, and continues to volunteer at Meow Cat Rescue. Dr. Gross lives in the Seattle area with her husband, three children, two cats, and a bunny. Dr. Courtney Wiese graduated from Washington State University’s College of Veterinary Medicine in 2016. She has always had a passion for cats and feline medicine. While in Veterinary school she was actively involved in the feline medicine club, did her senior paper on the importance of providing high quality feline medicine, and was awarded outstanding senior for feline medicine. Dr. Wiese spent the first 2 years out of veterinary school working as a feline-only veterinarian and recently transitioned to a small animal clinic in Bellevue that allows her to work with both dogs and cats. Dr. Wiese lives in the greater Seattle area with her cat-loving husband, Morgan, and their two pets - a dog named Brutus and a cat named Caesar. She is been supporting the Feral Cat Project for 4 years and looks forward to getting more involved. Dr. Julia Dunn grew up in Madison, Wisconsin and received her veterinary degree from the University of Wisconsin (class of 2011). In veterinary school, she was the vice president of the feline club. She also spent a summer in Ecuador, studying Spanish and the role of veterinary medicine in global heath. Following graduation she moved to New York City where she completed a year long clinical internship with Bluepearl Veterinary Partners, rotating between their hospitals in Manhattan, Brooklyn and Queens. She then moved to the Bay Area, where she worked as an emergency clinician for SAGE Centers. While living in San Francisco she met her husband/cat dad, Steve. After they moved to Seattle in 2015, Dr. Dunn decided it was time to pursue her longtime passion of feline-only practice. Sensing a strong community of cat lovers and a need for feline focused behavior services, she opened a mobile feline behavior practice, One Purr Away (onepurraway.com). She has since been delighted to work with numerous cats and their guardians throughout the Seattle area. In her spare time she enjoys volunteering in the clinic at FCSNP and is very excited to be on their board of directors. She and her husband live in West Seattle and are currently owned by two orange cats, Lola and Hurley. Originally from California, Violet always had a passion for the health and welfare of animals, growing up with cats, dogs, rabbits, rats, and guinea pigs. Violet adopted a bonded pair of cats when she moved to Washington in 2004, promptly becoming a self-admitted “Cat Lady”. Violet starting volunteering her time at local animal shelters as an adoption counselor and socializer, where she found the Feral Cat Spay/Neuter Project. Impassioned by their mission and values, Violet joined the Feral Cat Spay/Neuter Project Board of Directors in April 2018. Violet has a background in Neuropsychology, and she is currently working as an Aeronautical Engineer in Redmond. Violet lives in Maltby with her partner (Nate), four cats (Reptar, Nermal, Cinnamon Von Streusel, and Kitten), and two chinchillas (Sasha and Winry). In her free time, Violet enjoys gaming, reading, and cuddling with her cats. Jessi’s first introduction to feline love, was in the form of a renegade neighborhood wanderer named Bandit, who leapt from the then teenagers doorstep and made her home on Jessi’s lap. Not too long after, Bandit presented a gift to Jessi in the form of four little kittens. Very soon after that, everyone got fixed! While there was plenty of room in the heart, the homestead was plum out of space for anymore claws. In college, though she made no mention of cats, a reputation spread through the Daily Titan newsroom at California State University, Fullerton where Jessi was studying journalism, that she was “Most Likely to Become a Cat Lady.” To this day she knows not the basis for this badge, though somehow it sealed a fate. She now wears this label with honor and is embracing the positive attributes that comes with it - with dedication to the Feral Cat Spay/Neuter Project and their goals of providing low-cost services to neighborhood wanderers throughout the Puget Sound. Jessi and her spouse currently reside in Burien, WA and serve at the leisure of Pica and Chap, two fluffy black and white rescue cats not unlike Bandit before them. She has over 13 years of experience in Human Resources, Communication and Administration with an emphasis on engagement and event planning in non-profit and public agencies. When cats are not being cuddled, she enjoys foraging in nature then baking the evidence, photography and creative writing. Jennifer Hillman, Vice President, Outreach & Engagement, The Humane Society of the U.S.